I love a good challenge – always have. I thrive on the motivation and discipline it takes to meet a goal head-on. But we all have the same 24 hours in a day. It is how we choose to use them that matters. If it’s important, we will MAKE time. Writing is important to me. I am a teacher who realizes that teachers are learners first. These 31 days of writing have transformed my writing. I see myself as a writer; I understand the gift of writing. S – Step into the shoes of writers – not just “professional” writers, but as teachers, we step into the shoes of our student writers. L – Look all around you for ideas and inspiration – cherish the small moments in life. I – Ideas don’t come packaged in pretty boxes with perfectly tied bows. Writing is the way to ideas. Writing is thinking on paper. C – Communities of writers make writing come alive. We know the importance of an authentic audience for our students. I have learned a great deal by reading the slices of other writers. E – Encouraging other writers makes writing flourish. This audience is supportive, encouraging, and positive. It notices little things that we ourselves failed to notice. I will carry this over to my classroom. I don’t need to “fix” my student’s writing; I need to nurture it, encourage it, and notice what the writer did that moved me. 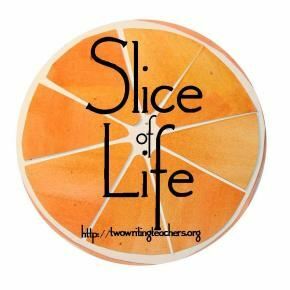 I look forward to Tuesday slices as an opportunity to spend a longer amount of time on each slice. I love how you said “We all have the same 24 hours in a day. It is how we choose to use them that matters.” Wise words for sure. Your poem puts the Slice Challenge into perspective too. Congratulations on reaching the finish line. Congrats. Some days it’s easier than others. I like how you put it in perspective. Hooray! You made it. Congratulations! Make time for what you value. I’m so happy you found value in writing this month. This challenge has also proved to me that it’s all about choosing how to spend your time. Your poem ties together so many of the benefits of daily writing. I’m going to keep making time for writing, too. See you around!